Are you guys doing anything fun for St. Patty’s Day? I have to say that it’s pretty low on the favorite holiday totem pole for me. But I am a huge fan of some corned beef and cabbage…yum! What a beautiful, springy look! Thanks so much for linking up with us today! Wow!! Not only do you do brights beautiful, you rock these pastels so Pretty!!!! Love that jacket and the pink bag just makes me smile!! You look gorgeous and I hope you have a most wonderful weekend sweetness! Loving these pastels on you! I’m used to seeing you in brighter colors, but these look gorgeous on you too! OBSESSED with these colors!! SO soft and beautiful. Your coat is fantastic!! I need all of that…I tend to gravitate to the bright colours and I was just thinking about what colour bag to get next. Pastel for the win! You have a great collection of coats Shauna and I just love this one. Some pastel blouses, a dress or two and definitely a designer pastel bag are on my must-buy list! Cotton candy chic is my kind of style, because I love the colors in this outfit! That jacket is just a beauty and your purse just goes perfectly with it! That baby blue color is gorg on you, girlfriend! I thought of cotton candy too! I love mixing soft blue and pinks, it’s so perfect for spring! You find the cutest coats/jackets at Asos! I LOVE this one! Happy St. Patrick’s Day and have a fabulous weekend! So much fun pastels in one post I can’t handle it!!! I am in LOVE!!! love that bag so much! You look so chic! Agreed, totally cotton candy chic, and I love it! Pastels are a must for spring. Happy st patty’s day! Spectacular pastels ! I am particularly drawn to that gorgeous bag. This pairing is SO PRETTY, Shauna! It does remind me of cotton candy, the colors blend together so perfectly; I adore that coat, it’s so unique! Thanks so much for sharing, beautiful, and I hope you’re having the best start to your day so far! Pastels are so spring-like! Your whole look goes together so well. Such a beautiful color combo! Perfect for Spring!! Love the look, these colors go together beautifully you look amazing. Pastels scream spring! I need to be more adventurous with them, and get out of my neutral rut. You look so pretty in this outfit, I totally love the pastel colors theme! Such a gorgeous pastel blue! I love the length of it too. Love the pink and blue together. I am obsessed with that jacket! It is perfect for Spring! i LOVE your coat. I love the color too! Love how you mixed your pastels! 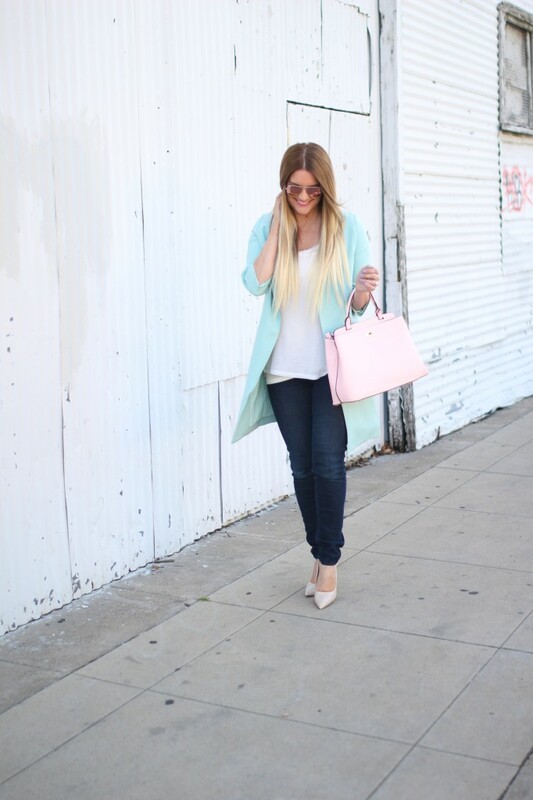 LOVE the combination of that mint jacket and pink! Such a feminine spring look! Such pretty colors! Have a great weekend! This is such a beautiful look! Love the pastels! Such a pretty color combo! I love your coat and bag! Swooning over all these pretty pastel colors! The coat is pretty and feminine. Thanks for joining the linkup. I’m dying, Shauna! Those colors are the IT colors for this season and you are rocking them like no other!! Swoon! I love pastels. It’s so cool to the eyes. You look lovely here as always. I love the jacket! It really suits you! I love this look girly!! So chic!! I do love cotton candy!!! Such a great look! I have been CRAVING something pink for my spring wardrobe and haven’t found a thing. This is perfect!!! These are two of my fave pastel hues! Dang, that mint coat is divine! You look so pretty and springy in this outfit. 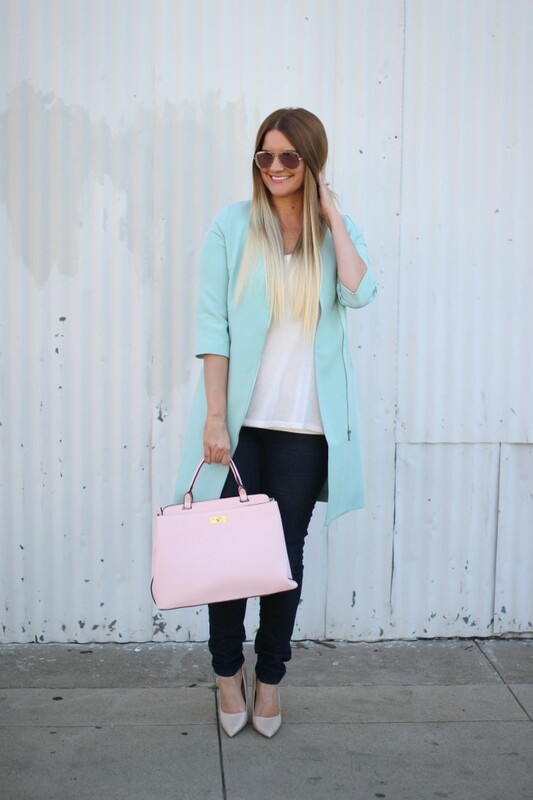 Pastels are my favorite – and I adore your bag! I love the combination of colors.The coat is so amazing. These colors work so well together. You look amazing as usual! You look stunning! Love the pastels and that bag is fab! I love your look and this pantone-color-of-the-year mix, you are absolutely rocking it! You look stunning on these colors!! Goregous look. In love with your bag and shoes doll.